We are in Aspen, Colorado today. Our trip here started two days ago when we drove, late in the day, to Crested Butte, a gateway to the Maroon Bell Snowmass Wilderness. Its claim to fame is flowers. 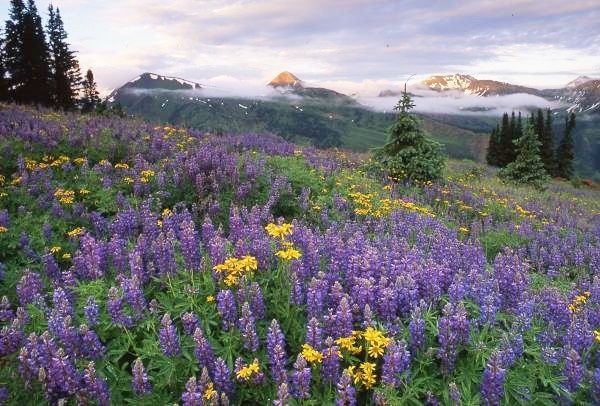 On the Crested Butte side, the glacial till provides high moisture retention and flowers grow in amazing abundance. There is an eleven-mile trail through there, over a mountain pass, to where we are now. We decided last year to book a room here and make that hike, and spend a couple of days here during their music festival. Since we are here without a vehicle, we had to pack our street clothing and stuff in, meaning I loaded a regular backpack instead of a day pack. I haven’t done that since 2011, carried such a heavy load. The hike was long, and included a 2000 foot ascent over a pass and then a 3000 food drop into Aspen. There were a couple of stream crossings, but all told, it was not a difficult affair. Yet we were very tired. Must be that aging thing I keep hearing about. The focal point of the area on this side are the Maroon Bells, two fourteeners that sit at the head of the valley we came down. One young man we talked to while waiting for the bus yesterday is going to climb them, both of them, later this week. It looks like a technical affair to me, as these are not walk-ups. It makes me feel old and silly for being so tired after having merely walked through the area. Other folks we met on the trail were doing the “four pass” trek, a 20+ mile trip that, as the name says, takes them up and over four high mountain passes on a circular route starting and ending in Aspen. 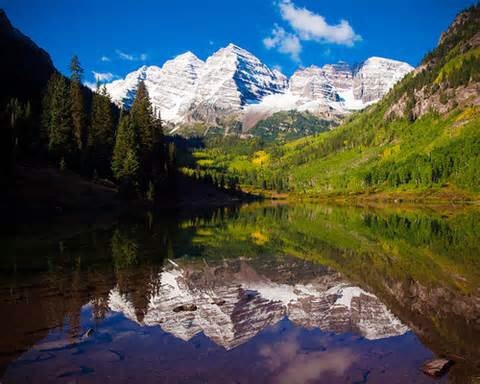 (I say “in Aspen,” but it is a shuttle bus trip of about ten miles to the trail heads.) That’s an overnight affair, at least a two-day trip. As we got closer to the trail head, where the bulk of the hikers are found, we found a cacophony of languages, much like hiking in the Alps. This is always a delight. The photos shown here are pulled off the Internet, explaining their high quality. And then … we were so tired we just turned on the tube and vegetated last night, and were reminded once again what is being done to the American people. The programming is stupid, and the ads incessant. I don’t, can’t make myself watch “news,” as that is the source of my countrymen’s colossal ignorance. It has two effects, one to dumb them down, and two to insulate them so that they do not know its true impact. They do not know what they do not know. It’s diabolical. Merely having that thing on has got to be harmful to people, and god almighty … what about the children? Ah yes, Crested Butte. Great granddad Bear (Medved) is buried there along with some of my other relatives and ancestors. It’s a wonderful town. My granddad was a sheriff and miner there in the 1880’s. My grandmother and mother were born there. They then moved over Kebler Pass down to Paonia because my grandmother had trouble with her lungs that altitude. You will miss the best part of the region if you don’t go to Paonia. It is the nicest town I have ever seen. We used to go back every summer as a kids to visit grandpa’s farm there. I almost made it back for the Fourth of July this year, but I couldn’t get time off for work. p.s. There’s a lady photographer there who takes some amazing photos of the region. She took one of my grandpa’s barn callled simply The Kralj Barn. I have a copy. I also have a photograph of Crested Butte on my wall. I love that place. Interesting side not: The youngest Koch brother bough a ranch that belonged to my cousin Bear, the Bear Ranch, and built himself an entire western town to play in. Too funny.